This anthology will remind you how much you are missing if you confine your interests to only the big-named comics creators. Comics are a big deal in the Latinx community, but you might not know how many Latinx creators are out there if your experience is limited to mainstream comics culture. 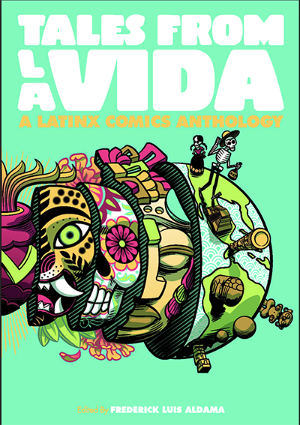 Enter Tales from La Vida: A Latinx Comics Anthology, edited by Frederick Luis Aldama, which includes the work of over 80 comics creators with a wide variety of styles and addressing a wide variety of topics. It's a sheer delight to read, and will remind you how much you are missing if you confine your interests to only the relatively small number of comics creators who have hit the big time. To put it another way, Gilbert and Jaime Hernandez (, the 'Hernandez Brothers', who are included in this volume) are well known and for good reason, but there are a lot of other talented Latinx creators out there that you probably haven't heard of. Each contributor to Tales from La Vida was asked to reflect on the most significant moments of their lives, and the resulting comics tackle a wide variety of topics, including language, identity, racism, and culture. Most of the comics consist of a single two-page spread, but the wide variety of artistic styles and types of storytelling on display mean that you will never get bored despite this common format. Some of the comics are in color, some in black and white. Sometimes the art is fairly realistic, sometimes more cartoonish. Some of the comics are traditionally drawn or painted, some use collage techniques, and some use photographs. Sometimes they are presented using a conventional series of frames arrayed across one or more pages, while at other times they use full page or double page spreads to create something more similar to a poster than to what Will Eisner would consider "sequential art". A comic is whatever a comics creator chooses to do with the medium, and these creators have come up with a number of ways to communicate their ideas. It's impossible to discuss 80+ comics in one review, but I can single out a few that particularly spoke to me, if you will. "Mixed", for example, written by Samuel Teer with art by Marina Julia, explores the complex identity of the author: his father is Caucasian and deaf, his mother an immigrant from Guatemala. Teer's mother stopped teaching him Spanish at his father's request, but his teacher doesn't know that and can't understand why he's failing Spanish in school. Meanwhile, the other kids speculate that he might be Jewish, Egyptian, or (I kid you not) Eskimo, but they're sure that he's something other than what they are. In the end, Teer decides that his identity is, as the title of the comic says, mixed. In "Latinx", Serenity Serseción explores what it means to grow up in a traditional Puerto Rican family when you don't fit neatly into a conventional binary gender system. Two colorful poster-like splash pages present her state of mind before and after coming to terms with her identity: before, she struggles to fit into a system that wishes her to conform in ways she really can't, while after she discovers that there are a variety of gender and sexual orientations, meets other people like herself, and settles into a self-defined identity that she finds satisfying. In "El Cabrón", José Cabrera focuses on a single key event in his life, an angry phone call he made (as an adult) to his father. The artist's mood is mirrored by his choice of backgrounds: while the entire comic is illustrated with finely-detailed ink drawings, the background during the call becomes darker and darker, eventually becoming completely black, as his anger rises. In contrast, several framing cells are drawn with the same detailed ink style but have white backgrounds, indicating his relative calmness after the cathartic phone call. Fernando Balderas Rodriguez uses manipulated photographs to create "The Origin of Aztec of the City Comic Books", which tells his story as an immigrant from Mexico along with the story of the comic books he created with his uncle. Leighanna Hidalgo also uses photographs in her comic "Reproductive Rebel", which explores the many ways other people have tried to tell her what to do with her body, including physicians who will not prescribe her birth control pills yet warn her not to become pregnant. Given the large number of contributors, it's not surprising that the quality of artwork and storytelling varies from one comic to the next. This is not a criticism so much as an observation, and the wide variety of voices and techniques on display lends an exuberance to the collection. Each comic is self-contained, thus making this a perfect book for browsing and for discovering new comics creators you like. An additional benefit of this format: if one comic does not particular appeal to you, you need only turn the page to discover a completely different approach that you may like better.